Angular is one of the most popular frameworks for building single-page mobile and web applications. In one of the previous tutorials, you’ve seen that you can embed DHTMLX Gantt in Angular apps. You can also embed DHTMLX Scheduler. To be able to follow along with the tutorial, you should have node.js installed. So if you don’t have it, go ahead and get it. Besides, you’ll need Angular CLI to set up the environment, you can get it with the package manager (npm install -g @angular/cli). 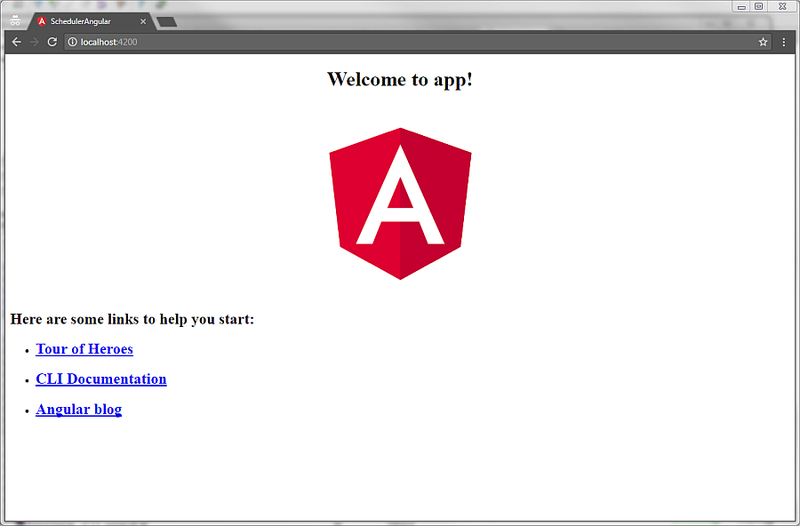 For more info, you can check Angular documentation. When the app is ready, a new browser tab will open, and you’ll see the start page. This happens automatically due to the –open parameter. Without it, you would have to open http://127.0.0.1:4200 by yourself. ng serve will also watch the source file and rebuild the app if any changes have been made. Later in the tutorial, you are going to create new components, models, and services for the app. So you need to create folders for them in src/app with the same names. The last one, ViewEncapsulation, is needed to correctly apply the styles for the scheduler. By default, Angular encapsulates styles of components by adding unique attributes to their CSS and HTML. 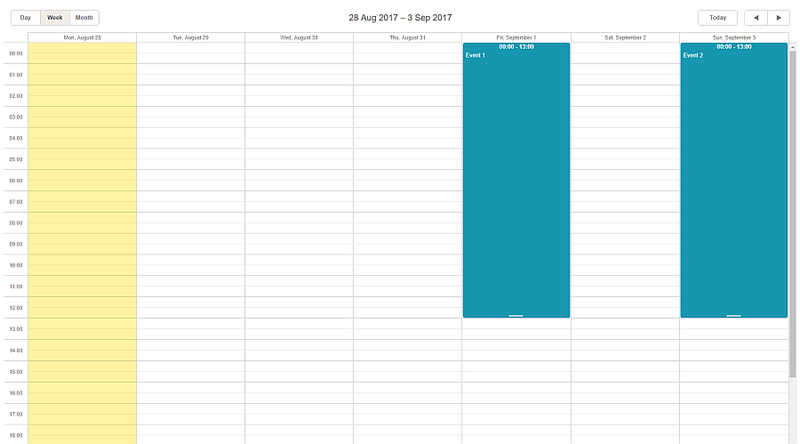 As the scheduler HTML template is created dynamically, using the default technique is impossible. The alternatives are to enable the native Shadow DOM view encapsulation or to disable it at all. Since the Shadow DOM isn’t supported everywhere, we’ll choose to disable encapsulation. 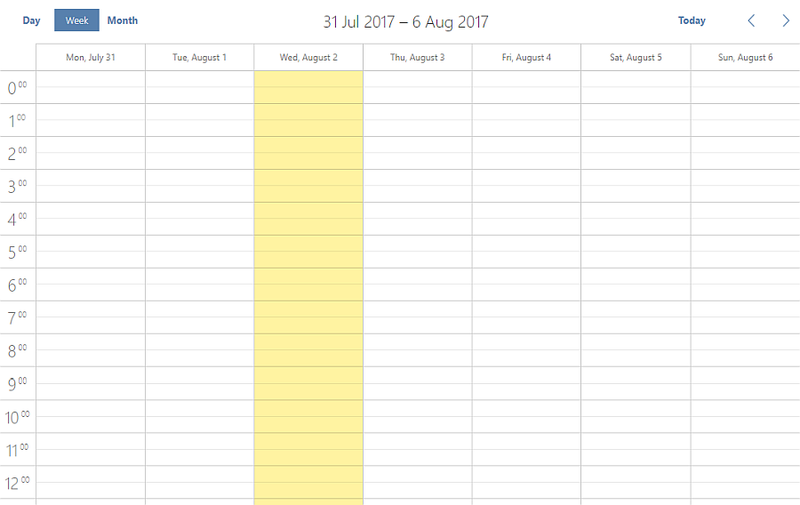 Later on, the component can be added to the page by inserting the scheduler tag. When the element is loaded, the scheduler is initialized inside the container. Now if you open the page again, you will see an empty Scheduler on it. Next, add the @Injectable() decorator to the service. The decorator marks a class as available to an injector for instantiation. You’ll inject it into the component later in the tutorial. Currently, the get method returns a resolved promise with hard coded data. However, you can load data from the server side and also return a promise. The issue will be discussed a little further below. Now every time a new SchedulerComponent is initialized, a fresh instance of the service will be created. ▸ call the services to get the function and then wait for a response to put the data to the scheduler. scheduler.parse accepts a data object in JSON format. You can check the complete code for the scheduler.components.ts file. Now, if you reopen the app page, you should see a scheduler with events. Creating an actual database and writing a backend is beyond the issues in this tutorial. Instead, we’ll mock the backend with the help of angular-in-memory-web-api library. It’ll catch an XMLHttpRequest and call the data storage defined on the client side. If you want the app to call the real backend, you can skip the first step. eventUrl is a private element of the service. It contains the URL to the REST API. In order to send HTTP requests, an HTTP class has been injected into the service. To update an item, you are to send a PUT request to url/item_id. This request also contains the updated event in its body. To remove an item, you need to send a delete request to url/item_id. Feel free to check out the complete code of event.service.ts on GitHub. Next, attach several event handlers to the scheduler object. They’ll catch adding, updating and deleting events in the scheduler. Inside the event handlers, services that’ll save changes to the backend will be called. Besides, you must remember that after you insert events into the database, they obtain database IDs. When it happens, you’ll update scheduler with the new ID using the scheduler.changeEventId method. Well, Angular Scheduler is ready, you are welcome to check out the source code. The app can use RESTful API for CRUD operations. Keep in mind that in this demo angular-in-memory-api library was used to emulate the data storage. However, in real life apps, you’ll probably want to save changes to a real database. There are two solutions. First, you can remove in-memory-web-api from the app (in case you’ve skipped that step, you don’t need to do this). Second, you can configure it to pass requests through to the real backend and thus implement data storage. Feel free to send us feedback in the comments and stay tuned for new tutorials. Thank you for the comment, we’ll correct the tutorial asap. Sorry for double post, html tag have been deleted in my previous post. The extra element is the closing div tag at the first line. It is possible to use Scheduler Extensions? To use extensions you should add them with dhtmlxScheduler. E.g. import “dhtmlx-scheduler/codebase/ext/dhtmlxscheduler_timeline” for timeline extension. I have downloaded the scheduler by npm but it doesn’t have the timeline extension. Where I can find it? Timeline view is a PRO feature of dhtmlxScheduler. Currently, we don’t provide an npm package of the PRO version of dhtmlxScheduler. Right now the available solution is to add a PRO package of dhtmlxScheduler to your project by hand. If you want to use it with npm – you could put the package to your private npm feed and install it from there. I’m currently evaluating a trial version of this product for use in a project and wondered how best to implement the Timeline View within the Angular framework. How to use the “Professional Edition” version? I already bought a few months ago the “Professional Edition” version. Unfortunately, the installation of dhtmlxScheduler PRO edition via NPM is not available at the moment. But as you are the licensed user, please create a ticket in our support system and we’ll provide you a personal NPM link. UPD: Currently, we don’t provide an npm package of the PRO version of dhtmlxScheduler. If you use NuGet or npm, you can create a package out of the PRO version of dhtmlxScheduler manually and add it to your project from a local directory. I transmitted this problem on the forum and on your support (while I pay) and I received no response! When you are working with script includes it means that you are adding a script tag for dhtmlxscheduler.js first, and script tags for extensions after that. In case of import, the situation is a more complicated, as import doesn’t guarantee that imported sources will be processed in the defined orders. If you are using webpack – try to use script-loader for scheduler’s file, which will preserve an order of includes and will fix the issue. Thanks, Benjamin! We’ve just fixed it. We are currently evaluating scheduler component for our Angular 5 application. However we found a problem with implementation. However angular event emitter (line: this.rangeChanged.emit …) is not accessible in the body of callback function. Can you advise how can we emit value using Angular EventEmitter from inside of onBeforeViewChange callback function? Hey Guys, is there a chance, Drag and Drop functions could be enabled ? Thank you for the tuto. even though I’ve installed it with npm and there is no error in the source code. File ‘…../node_modules/@types/dhtmlxscheduler/index.d.ts’ is not a module. I commented this part and the scheduler is rendered, however not sure whether this will impact some functionality which I have not implemented yet. ERROR in src/app/components/admin/scheduler/scheduler.component.ts(20,5): error TS2304: Cannot find name ‘scheduler’. So is this scheduler for Angular ready or it is still a work in progress? Our tech specialists answered your question on the forum: https://forum.dhtmlx.com/t/dhtmlx-scheduler-and-angular-6/65611 Please keep up the discussion there.